For every commercial giant there should always be a small independent, furiously carving it’s own path in the behemoth’s shadow. This has certainly been the case in comics, while Marvel and DC take the bulk of the market share there have always been the Indies, from the old days of cheaply photocopied and stapled mail order comix to today’s digital battleground where all that divides the rising stars from the old stalwarts is visibility and marketing. SPARKS is the cinematic equivalent. 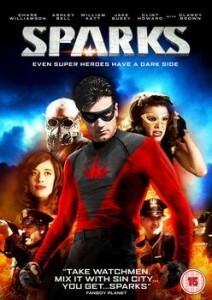 A low budget superhero picture written and co-directed by Christopher Molino based on his own comic. It’s brave to attempt such a thing without the dollars to back you up and the movie relies on a mixture of green screen (with digital backgrounds stepping in where scenery budgets couldn’t) and a storyline that relies on fisticuffs more than city-shattering shakedowns a la THE AVENGERS or MAN OF STEEL. All of which is fine, noble even, I love a creator who refuses to let such irritations as a slender wallet get in the way of making art. 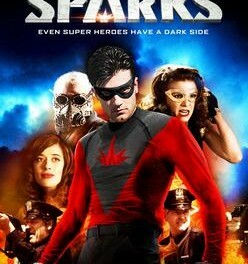 The problem with SPARKS isn’t it’s budget. Set in 1940, the story centres on Ian Sparks, who, after the death of his parents, takes to dressing up in a costume and fighting crime. Criminals are a cowardly and superstitious lot, after all. His career doesn’t go well, as he explains to a valiant Clint Howard, the majority of the movie taking place in a series of flashbacks. Sadly it’s all very confused, made up of a blend of the overly familiar with the overly contrived. The script and the acting are where a low budget movie can make us forget when a few corners are cut. But only if they’re good. The story doesn’t hang together and the dialogue is the sort of purple, clunky stuff that non-comics readers assume the medium is full of but isn’t. Sadly, it all becomes dull and if there’s one thing a comics adaptation shouldn’t be, regardless of the size of its budget, it’s that.